Palmetto Printing was estabilished in 1980 as a small two man shop. 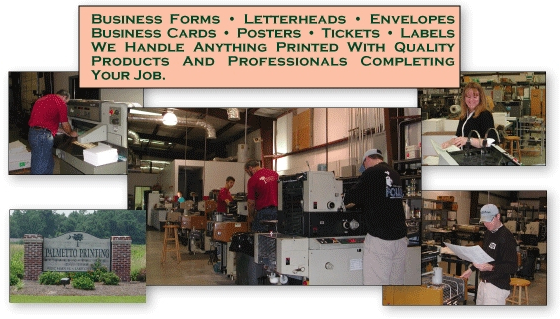 Since 1980 it has grown to a full service printing facility serving many industries, commercial businesses and Government offices, in the Pee Dee area, Charleston and as far as Columbia. The people at Palmetto Printing are trained and qualified to complete the most complicated printing task that a business or individual may need. There are four full time printers using cutting edge machinery for any job requirements.